Tis the season for everything pink. I love it. Although, I do love every holiday. This one especially strikes a chord with me because it was one of the most memorable holidays at school as a kid. If it still made sense for me to give out Valentines to all of my friends, I totally would. I even did it in high school (seriously). Nowadays, I love all the sassy sayings you can find on things around Valentine's Day. I pretty much find something adorably Valentine's Day oriented (that I want) every day. I decided to make a list of some of those things, along with some of the other items I've been eyeing up over the last month or so. 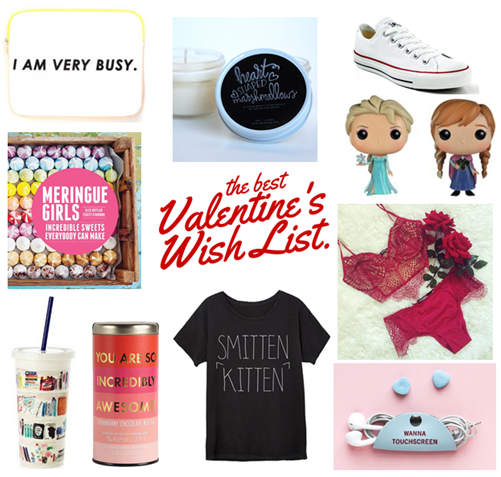 I don't know what inspired me to call it the "best" Valentine's wish list...is it because it's mine? Probably. Enjoy! 1) Ban.do "I am very busy" iPad sleeve - I've been looking for this in stores that sell ban.do for a while, but I could only find the pencil case. This is the only site I could find that still sells it, since ban.do has already come out with their spring line. Now that I actually have an iPad I really really want it! And I am very busy. 2) Candelle's Jessica Garvin "heart shaped marshmallow" 4 oz soy candle - It sounds like it smells delicious, and I'm a sucker for Jessica Garvin's chalkboard art. I love her can coozies that I bought last year. But I'm obsessed with candles. 3) White Converse - I want to monogram the tongue of these and wear them in Europe. Big dreams. 4) Meringue Girls cookbook - I've been eating meringue cookies since I was little (I'll post my recipe eventually) and I have since fallen in LOVE with the Meringue Girls cookies. Their cookies are so pretty and I am dying to learn all their tricks. 5) Elsa and Ana POP Disney figures - I saw these at Barnes & Noble and determined that I have to have them. I thought they would look so cute on a desk as decoration. 6) For Love and Lemons "Bat Your Lashes" underwire bra - It's the prettiest thing I've ever seen. I love the navy blue too, but I tried to keep with the red/pink theme here. This set is a little/a lot out of my price range, but someday. 7) Kate Spade "Like a Book" Insulated Tumbler - I love books, I love Kate Spade, and I love insulated tumblers. Why wouldn't I get this? 8) "You Are Incredibly Awesome" Strawberry Chocolate Red Tea - I've liked different teas from Republic of Tea and this flavor sounds interesting. Unfortunately this is sold out at Papersource online, but I definitely saw it in the actual store last week! 9) ily Couture "Smitten Kitten" Tee - I promise I would be smitten with this t-shirt if I had it. Stickin with the V-Day theme. 10) This is Ground Sweetheart Taco - This is a weird concept, but also a convenient one. No more tangling up my stupid headphones! They have 5 different cute Valentine's Day sayings for these earbud tacos. So hopefully I'll be able to invest in some of these things before Saturday! If not, there's always next year.